Jack and his older brother, Evandor, went to see a movie. Evandor picked it out. Jack didn't like scary movies, but didn't want his brother to think he was a baby, so he went. Jack closed his eyes a lot. He didn't want to see monsters eating other monsters and ghosts scaring little children. Evandor bought Jack popcorn and a soda and Jack tried his hardest to be brave. After they got home, their mom had supper waiting for them. They ate chicken and rice and broccoli, but with every bite, Jack thought about the monsters and ghosts. He wished he hadn't gone. He just couldn't get the thoughts out of his mind. Jack took a bath and put on his pajamas. He climbed into bed and pulled the covers around his neck. His mom came in to say goodnight and turned out the light. The room went dark. Jack looked out the window and saw stars and the moon. "I'm just being silly." Jack smiled, rolled over and closed his eyes. He woke up in the middle of the night and sat straight up in bed. "What was that noise?" He listened carefully. "What was that?" Jack lay down and pulled the covers over his head. "It's a ghost, just like the one in the movie." Jack cried with fright and didn't dare look. After ten minutes passed, he didn't hear the sound again. He dared to look. When he peeked over at the window he saw the wind blowing the trees. "Oh, it was only the wind. I'm so silly!" He took a deep breath and lay back down, closing his eyes. He fell to sleep quickly. An hour later he woke up and sat with his back against his pillow. "What is that noise?" He listened. "It's not a ghost. It sounds like someone snoring. Maybe there is a monster under my bed." Jack looked to the left and to the right, but didn't see anything. "It's probably Dad snoring real loud." He heard the snore again. "That is not my dad. There's a monster under my bed!" Jack took a deep breath. He was tired and wanted to go to sleep. "Enough of this." He climbed out of bed and bent down to look under. "Yikes! There is a monster under my bed." Jack screamed as loud as he could. "Mom! Dad! Help!" The monster woke up and looked at Jack. "Yikes! It's a kid!" The monster jumped up and ran over to the window. He leaped outside just as Jack's parents came in the room. "Jack, what's wrong?" His mom ran over to him. 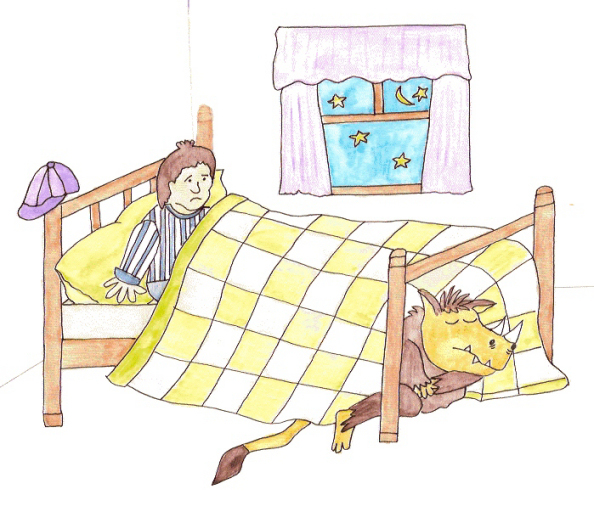 "There was a monster under my bed. It just jumped out the window and ran away." Jack shook with fear. His dad went to the window and looked out. "I don't see anything. You know what I think? I think you had better not go to see movies with your brother again. You're having nightmares." Jack's mom agreed. She took Jack by the hand. "Into bed you go. Your dad has locked the window." She knelt and looked under the bed. "There's nothing under your bed any more. Now go to sleep. We'll leave the light on in the hall for you." After his parents had left, Jack lay in bed. "I guess they're right. After all, there is no such things as monsters. I just imagined it." He rolled over and went to sleep, not seeing the monster looking in the window at him.